Many companies struggle to develop their innovation culture, and often their starting point is “We need an innovation culture”, or “How do we get an innovation culture”, or “We are too bogged down in everyday operations to have time for innovation”, or “We need a quick fix”. It seems like the approach to innovation culture is either too treat it as too complex to handle, or to view it as yet another “problem” which can be handled with a quick fix or a system. Innovation is complex, when it comes to make it stick. But it is also complicated (which is an entirely different thing, and much easier to handle than complexity). And this is where INNOCULTURE, our new Innovation board game, comes in. This week I received the first 5 copies of the INNOCULTURE game, which we have developed in a joint project between FINN KOLLERUP as and Henning Grubb Basballe from Copenhagen Game Lab. We’ve spend more than 600 man-hours to develop this game, and we are very proud of it. I have discussed the standard in the blog post “Use the European Innovation Management Standard as your Innovation Checklist“. The standard represents a huge effort to identify all the different elements that need to be included in an efficient innovation management system. The underlying assumption is that innovation is a set of skills and practices, which to a large extent can be described. With innovation, there are definitely some things that are better to to than others. The problem is that the body of knowledge on innovation is very big and messy. No one really grasps the entire field. In the standard, this body of knowledge has been collected into a number of documents, where best practices have been described in a coherent manner. The problem is of course that even with this standard pretty much in place, the amount of knowledge is still overwhelming, so how can we work with this in an engaging manner? 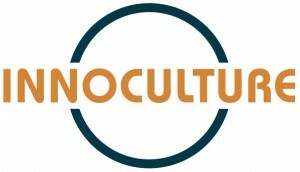 That was the question we set out to answer, when we embarked on the development of the INNOCULTURE game. How can we Gamify Innovation Culture? How can we make a game based on the European Innovation Management Standard, that allows people to engage themselves to work with innovation culture, and at the same time learn about innovation best practices, and to subsequently apply this knowledge to create, apply and develop their own innovation management system? To develop a learning game, many skills need to come together. Obviously, you need to have deep knowledge about the subject matter, in this case innovation – Finn Kollerup has been working with innovation for 20+ years (Check). You also need to have a solid knowledge about game mechanics – Henning Grubb Basballe and Copenhagen Game Lab has been developing games for over a decade (Check). You also need to make the game visually appealing – Josephine Dahl is a fantastic illustrator and creator of strong visual metaphors (Check). In order to create the content, Finn scrutinised all the published elements of the European Innovation Management Standard, in order to identify key elements and drivers of innovation culture. The list of elements was indeed very long, and we had to make compromises a long the way, to arrive at a list that was recognised as important for innovation and at the same time comprehendible so that it could be easily understood in a learning setting. The game can be played with groups of 4-6 people. In principle, there is no upper limit to the number of people that can play, but a total number of 30 people is typical, i.e. around 6 groups that compete with each other. The game is played in three rounds, through three scenarios of a fictitious company, which constitutes a 10 year period all together. Each scenario represents a typical set of innovation challenges. The players are briefed before each round, and presented with a description of the basic situation, together with three clues (e.g. letters, mails, news articles etc.) that relate to the given scenario. The group is also equipped with a number of chips, which represent the amount of resources available. The groups task is now to decide which of the 6 focus areas to work with – but there is a catch: Since the number of resources is limited, the group can only pick two of the six focus areas. The choice of focus areas then scopes the resource allocation. In the first round, the players have 6 chips, which they can use in relation to the chosen focus areas. Collaboration around Ideas: You create physical and social spaces for ideation, and take steps to develop a strong culture, where employees are motivated and educated to collaborate on innovation. 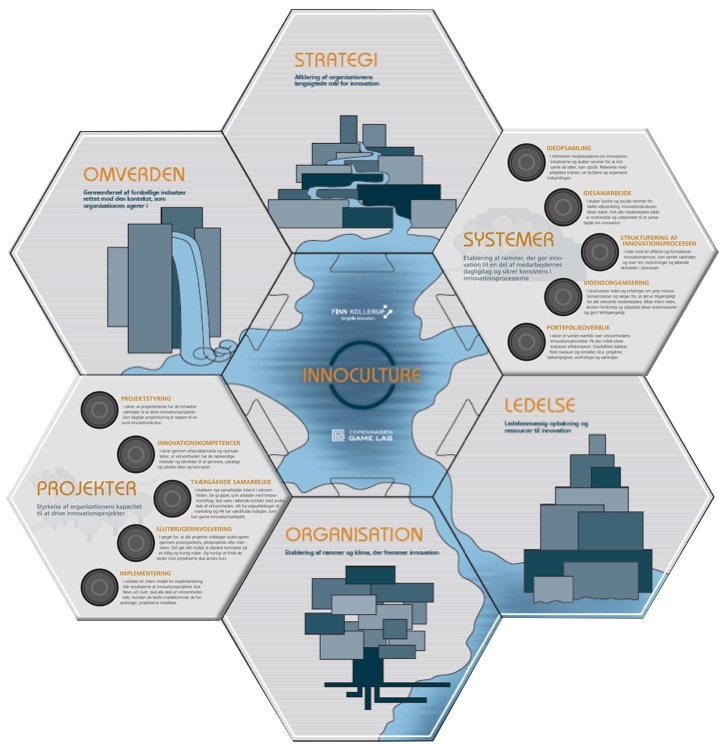 Structured Innovation Process: You create and organise tools for innovation, and create a formal overview of milestones, decisions and activities. 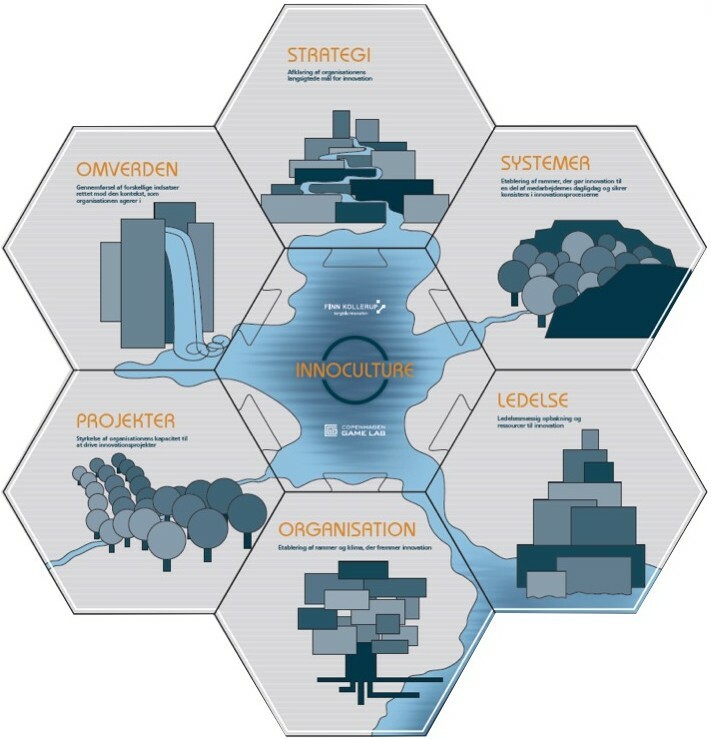 Knowledge Organisation: You structure your knowledge and best practices about innovation processes, and make it available for all relevant employees. Portfolio Overview: You ensure that you have a clear overview of all innovation activities, including projects, idea campaigns, workshops, tools etc. Project Management: You ensure that all project managers have the tools necessary to drive innovation projects. Innovation Competences: Through training of experienced employees as well as new hires, you ensure that your organisation has the necessary skills to generate, select, and develop new concepts. Cross-functional Collaboration: You establish new collaborations across the organisation, knowing that all functions possess useful insights that can leverage your innovation efforts. End User Involvement: You ensure that the end users are involved in all projects, making it possible to try new concepts early on, and to change direction, if necessary. Implementation: You develop an internal model for implementation, and ensure that everybody in the organisation understands the changes associated with realisation of the innovation projects. In the next round, you are presented with a new scenario, and clues related to this. You also receive additional chips, and have to decide which two additional focus areas you will work on. The initial two areas are still in play. In the final round, you choose the two remaining areas by default, and get a third scenario description with associated clues. You may download an INNOCULTURE product sheet from our Materials & Methods section as well. How do You use Gamification? Please feel free to post comments to share your thoughts on how you use gamification in your innovation projects.